“After 11 years in our house, our kitchen was definitely dated and dark,” Michelle says. 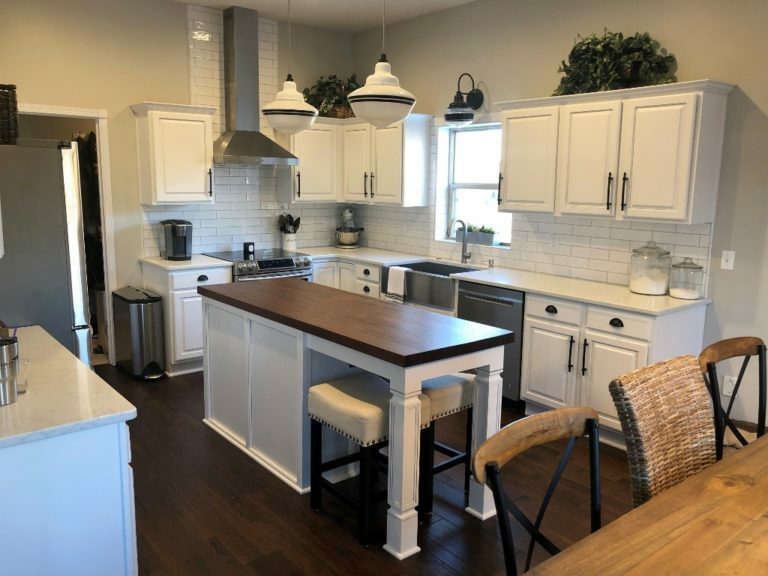 “I truly love our home and want that reflected in the spaces where my family and I spend most of our time.” Although she was all about the farmhouse craze, Michelle decided on a more classic and timeless look for her kitchen. She opted for a mix of modern metals, the warmth of a butcher block island, plus vintage-inspired lighting. “Having purchased lights for our basement from Barn Light Electric, I knew the customer service and quality would be outstanding,” she explains. 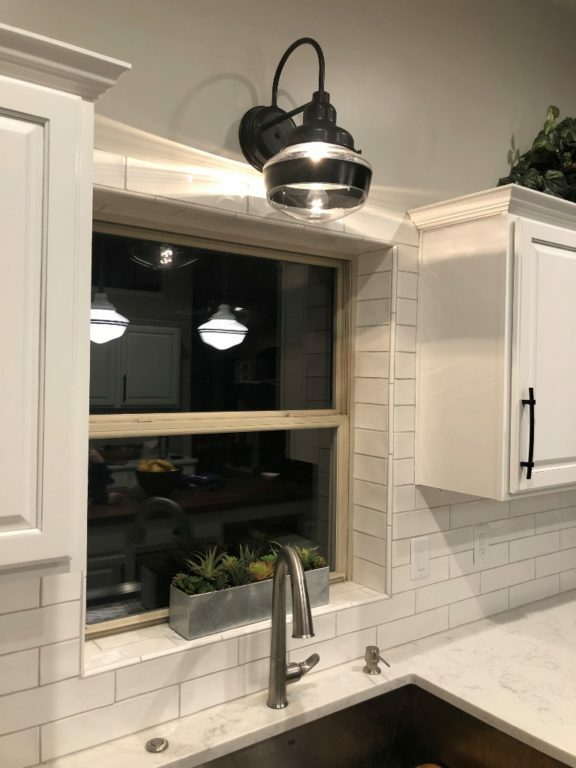 “There’s just something about emailing a company and being able to speak directly with the same person from a project you did years ago and they remember you.” Michelle chose the vintage look of schoolhouse lighting for her renovated kitchen. “Schoolhouse lights are a little bit of retro with a modern flair,” she notes. “I like combining eras when designing spaces in our home. 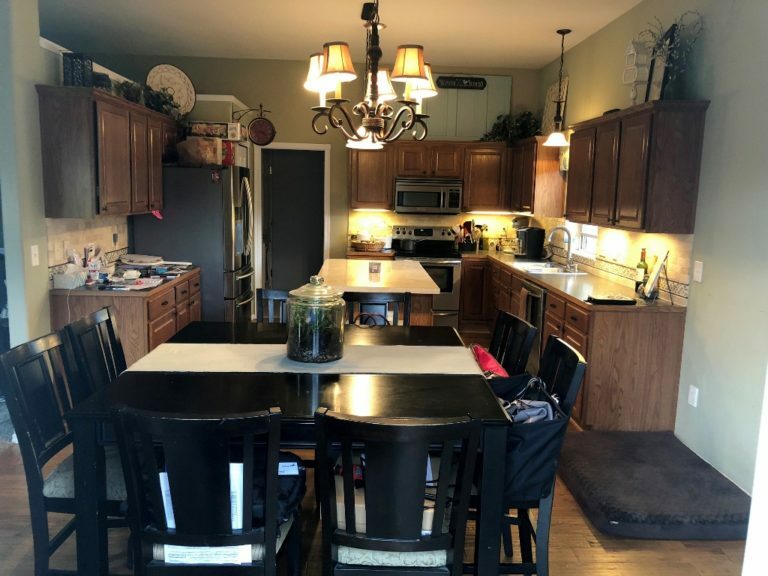 It’s fun yet classy.” With the island as the focal point of the room, Michelle wanted to make a statement over the butcher block top that her husband and their 16-year-old son made with help from a family friend. 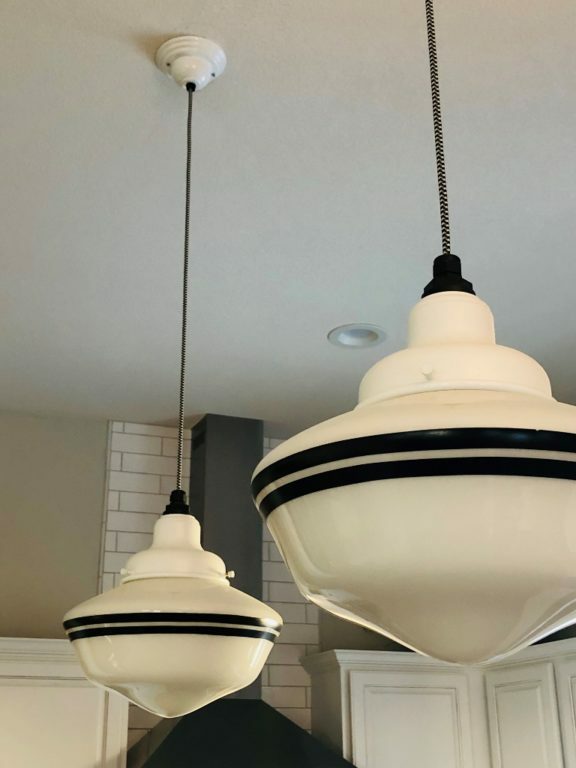 She chose two Elementary Schoolhouse Cord Hung Lights and customized these pendants with large, opaque globes painted with a double band of Black, plus black-and-white cloth cords. “I love that you can customize down to the smallest detail,” Michelle says. “The fun cord is one thing that really sets my lights apart from others. 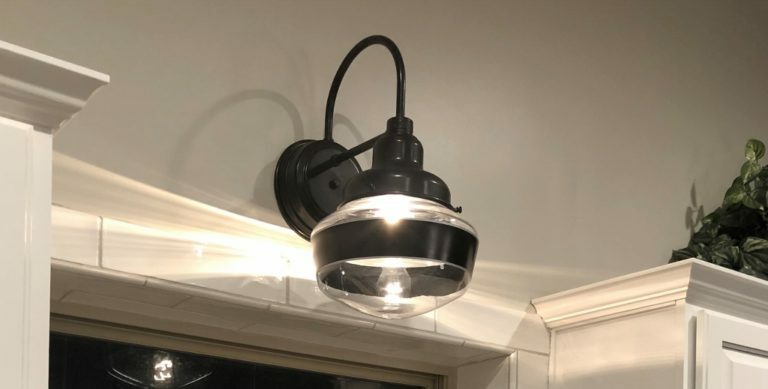 I even specified that I wanted the nut on the top of the fixture to be black.” Over the sink, she opted for the complementary Mascot Schoolhouse Sconce. This handcrafted fixture features clear glass and a single painted band of Black. “There is a lot of bright white in the room so the heavy, black fixture and band are a great contrast,” she notes. “The thin silver line bordering the band ties in with the grout and wall color perfectly. 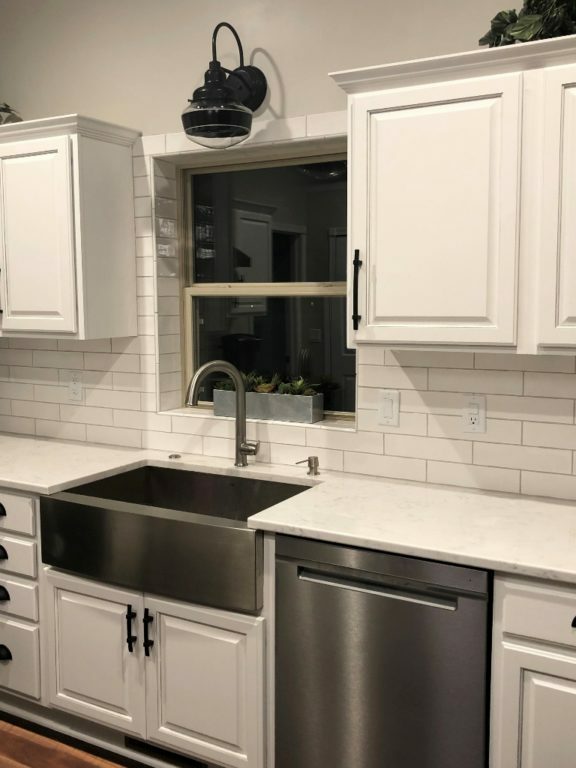 And the clear glass casts a neat pattern on the wall and illuminates the sink nicely.” The schoolhouse lights fulfilled the simple yet striking look Michelle envisioned for her kitchen.